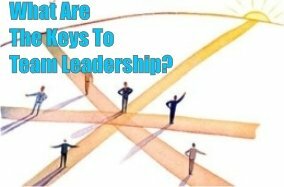 What are the key factors of effective team leadership? If there is one primary responsibility of leadership it is to bring people together in a way that promotes creativity, connectedness, and collaboration. With a safe environment comes effectiveness and productivity. In these types of teams, in this type of company, there are specific types of leaders. Of course all leaders are not the same. But they share a common trait they don't lead in the traditional "top down" manner. The fear of separateness first encountered in infancy is the source of all fear and anxiety. Tyrants can no longer effectively manage a diverse, highly-educated, flexible, and independent workforce. Self-motivated, intelligent and skilled folks simply won't work for people who treat them like they don't matter. Business and team leadership in the 21st century is more a matter of influencing the culture within which work is done, in the pursuit of a shared goal. Traditionally, "influencing" seems to be something that is "done" by a leader to his subordinates. A very "top-down" event. Inspiring teamwork is a skill that allows people the freedom to achieve new heights of accomplishment through effective use of the team's collective skills. In this way you allow people to fulfill their own destiny, their work becomes the vehicle that will allow them to achieve both their professional and their personal goals. Does Great Leadership Leave Footprints? Great leadership is about developing a sense of ownership within the team and steering the emotions toward the group's goals (not just your own). It isn't about intimidation or manipulation. Great leaders encourage our passions and remind us of the spirit and optimism that we had when we went into our field of work. By harnessing this passion and the ability to get to people's core motivation, great leaders naturally demonstrate their team building skills. Results, team morale, an ever widening sphere-of-influence, talent acquisition, and retaining top-level performers. And the big one: a constant stream of more great servant leaders. Leadership is a skill that is taught by modeling the way. . . Leadership and team building push people to do great things. They encourage us to harness our collective emotions and skills, for good or for bad. Most of us are skilled. We do what we know how to do. Whether you're in marketing, human resources, management, etc. when you're put into a team leadership role we tend to default back to do "what we know" when things get tough. Often we begin neglecting aspect of managing our team that we don't know so well. Becoming a great leader means putting the past behind you, and embracing all the aspects of your team. Now not only are you leading the department or team you once used to be a cog of, you are now leading other departments as well. It's easy to lose sight of the big picture. This change in perspective is difficult for many new leaders to get used to. Hence the staggering failure rate of new team leaders (somewhere around 40%). True leadership is about taking a larger overview of the entire operation. It's been described as "knowing the music" of leading a team. It's also about letting go of your need to control people and trusting them to do their jobs to the best of their ability. Do you know the music of team leadership? Are you able to let go of the everyday workings and intricacies of what you used to do, and allow others to do their jobs?